Among the Minangkabau ethnic group in West Sumatera, who created this extraordinary dish, Beef Rendang is the piece the resistance at any formal occasion, especially when graced by the Sultan himself. This sis because its preparations are most painstaking and require a lot of patience since cooking this takes hours before it is deemed exactly right. 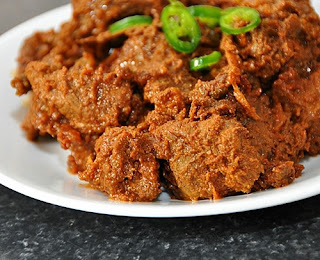 It is small wonder, therefore, that Beef Rendang has been voted the Most Delicious Food in the World by CNN-Go viewers. Beef cubes are slowly simmered with coconut milk and mixture of lemongrass, galangal, garlic, turmeric, ginger, chilies and shallots, then let to stew for a few hours to create this dish of tender, flavorful bovine goodness. There are two type of Rendang, the dry and the stew type. The best is the dry Rendang when the meet has become sweet and crunchy, soaked in the mixture of aromatic herbs. In Bahasa Indonesia, the word "sate" means marinated meat, which is skewered and grilled over an open charcoal fire, then usually served with peanut or sweet soya sauce. Meats can be chicken, beef, goat, pork or even fish. While skewers are made of bamboo, sometimes the midrib of the coconut leaf, whereas Bali uses lemongrass as skewers for sate, to add just that bit of flavor. Ingredients include shallots, candle nuts, garlic, chiles, which are ground to a fine paste then saute'd until fragrant and mixed with ground peanuts, sweet soy sauce, salt and water added. Skewer the meat, marinate with half of the sauce for two hours then grill over an open fire, turning occasionally. Eaten as a cocktail dish or as a meal rice, satay never ceases to be a favorite at parties. 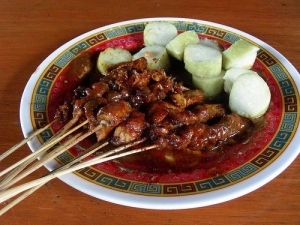 Satay comes from Central Java, East Java and Bali. Indonesians find thqat no dish is complete without sambal. In dire need, rice with sambal suffices. Sambal is chili-based condiment. Indonesia has more than 300 varieties of sambal, depending on the meat or fish served, the place of origin and of course herbs and vegetables available in the surrounding. Sambal can be extremely spicy-watch out for the small green chilies that are very hot, belying their size and color-to nicely mild. This is chili fried with oil, garlic, terasi (dried shrimp paste), candle nuts and others. It is dark and rich in flavor. For example is typical Manado sambal from North Sulawesi. Consisting of coarsely chopped tomatoes, calamansi, shallots and basil, chili, vegetable oil and salt, this condiment is usually served with barbequed fish, which is abundant and almost a staple in the region. Dabu-dabu comes closest to the Mexican salsa sauce. This is the most common and most popular sambal. 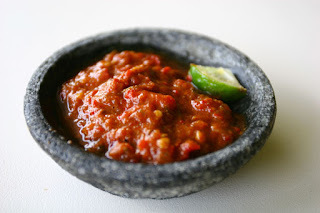 Similar to the Malaysian belacan, sambal terasi has a stronger flavor due to its fermentation. Sambal terasi consists of red and green peppers, terasi, sugar, salt, lemon or lime juice. Sometimes it comes fried with pounded tomatoes.